Day 79: 4/22- Who do you think will win the race? Wolverine or the snail? Day 81: 4/24-AGAIN Dunkin gave me a coffee missing 1/4th of the drink! Day 82: 4/25-Not sure if I should take a bite out of this candy, because one is already missing! Day 83: 4/26- Mr. O makes me iced coffee for work. Awww. Day 84: 4/27-Ha! Well, it is true. I had a lot of voice mails that day. Day 86: 4/29-My niece wanted a hamster for her birthday. So I printed a picture of one for her. 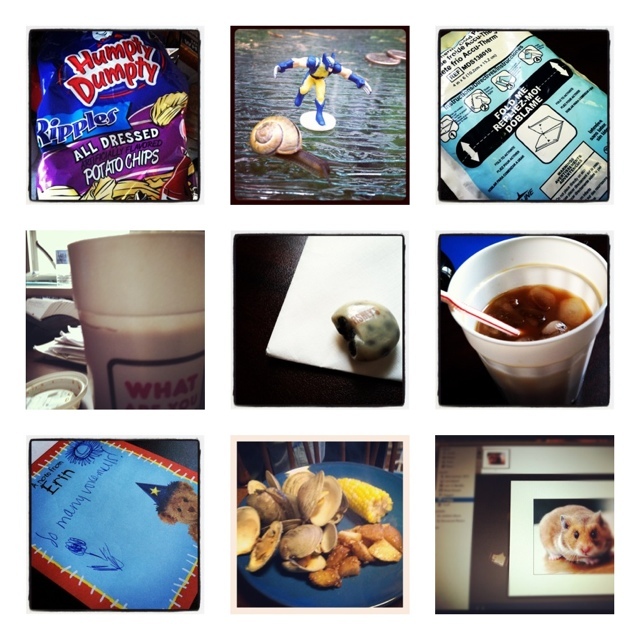 This entry was posted in 365 Photo Challenge, Pictures. We have two bags left and no plans to go to New Hampshire next!